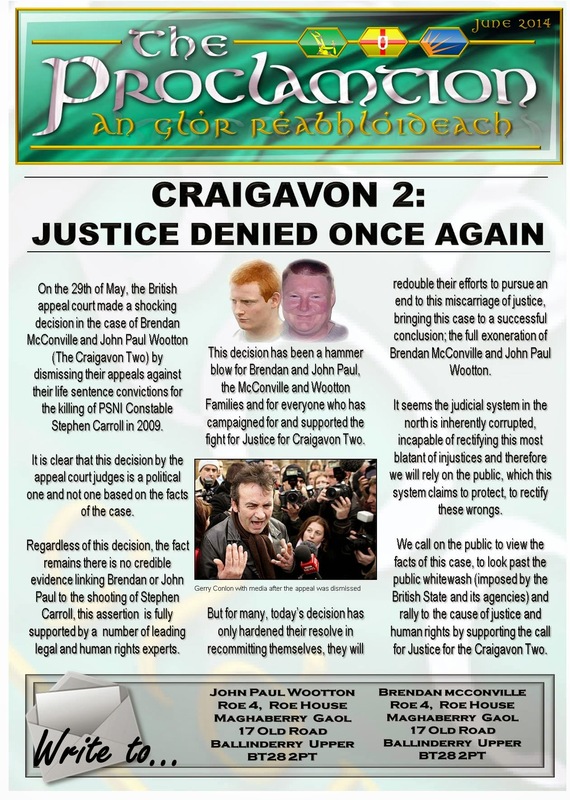 Letter from the Craigavon Two, Brendan McConville and John Paul Wooton. 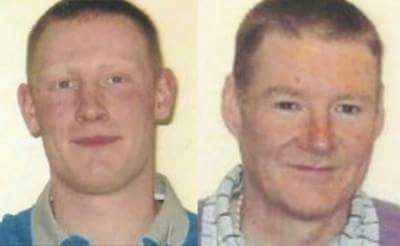 John Paul Wotton (left) and Brendan McConville (right), two innocent men convicted for a crime they ‘did not commit’ British Scape-Goats, serving the rest of their lives in an English Prison because (simply their Irish) and someone had to pay !!! 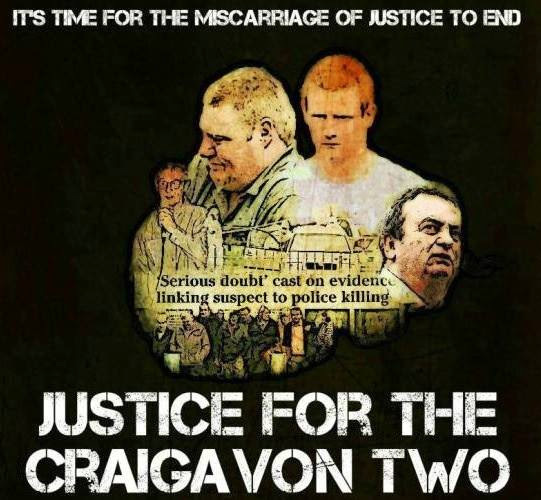 Hello, We the Craigavon Two as we have become known, Brendan McConville and John Paul Wootton are to begin our appeal against our life sentence convictions for the killing of PSNI member Stephen Carroll. 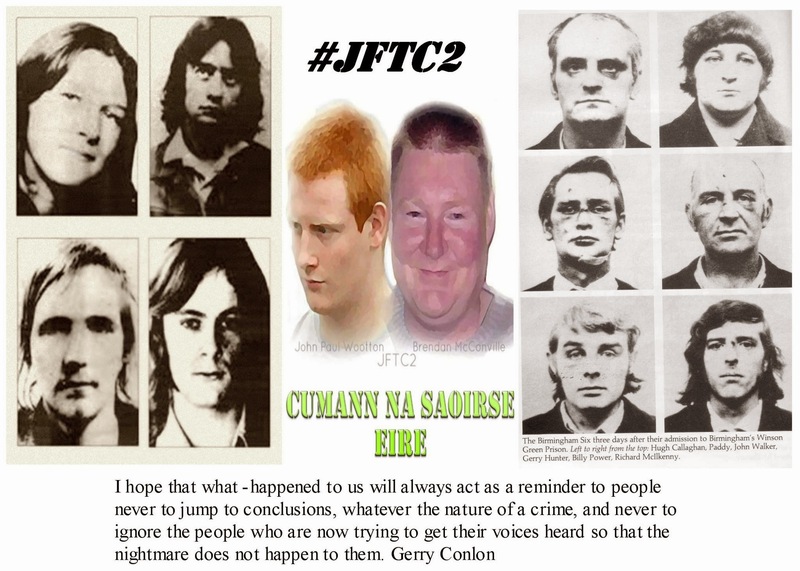 We have consistently maintained our innocence and we believe as do others that the case against us represents a serious miscarriage of justice,we were tried in exceptional circumstances under the old and seriously flawed Diplock process, a hangover from the long conflict here, this system deprived us of a trial by a jury of our peers, instead a single judge presided over and convicted us. The entire case against us was circumstantial and we believe seriously flawed, large tracts of evidence was hidden from us and the public, claiming national security. Public interest immunity certificates prevented our defence from properly investigating the evidence and cross examining witnesses vital to our defence case, in effect we were left with one arm tied behind our backs. We do not believe this represents clear and transparent justice. A number of groups and individuals after reading into our case have expressed sufficient concern that many have stated publicly they will be attending the appeal process to provide independent oversight. 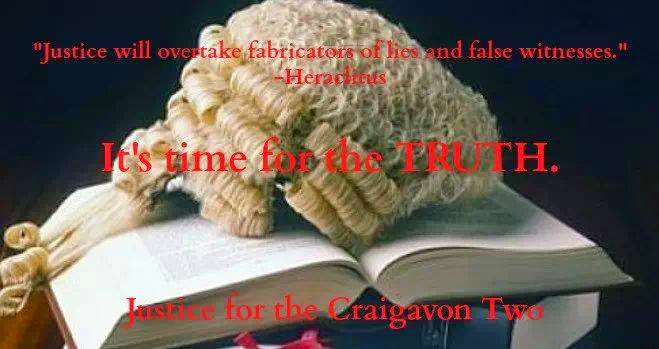 Our appeal starts on Monday (29,4,13) we the Craigavon Two, Brendan McConville and John Paul Wootton call on you, the public to observe the appeal process, this warped version of justice is being administered in your name. And we ask you to look past the sensationalist headlines and look at the cold hard facts of this case, your voice matters, do not let this miscarriage of justice continue in your name. 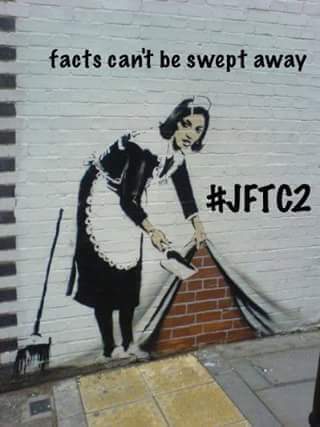 Author seachranaidhe1Posted on April 3, 2017 Categories JUSTICE FOR THE CRAIGAVON TWO, WORTHWHILE CAUSESTags #JFTC2, 'did not commit', (29, 17), 26/4/17, 4, a trial, administered, appeal process, as do others, as we have become known, attending, begin our appeal, Brendan and John Paul, Brendan McConville (Yandy), British Scape-Goats, call on you, case, case against us, circumstantial, cold hard facts, consistently maintained, continue in your name, convicted for a crime, convicted us, Craigavon 2, cross examining, defence, deprived, do not let, effect, English prison, entire case, expressed sufficient concern, groups, hangover, Hello, hidden from us, immunity certificates, individuals, innocence, instead, John Paul Wootton (JP), jury of peers, justice, Kevin Kinsella, killing, large, left with, Letter, life sentence, long conflict, look past, Maghaberry Gaol, matters, miscarrige of justice, Misscarige of Justice, Monday, National security, not believe, number, observe, one arm behind our backs, prevented, properly investigating, provide independent oversight, PSNI/RUC member Stephen Carroll, public, public interest, reading into our case, represents, represents clear and transparent justice, rest of thier lives, sensationalist headlines, seriously flawed, seriously flawed Diplock process, serving, simply their Irish, single Judge, someone had to pay, starts, stated publicly, system, the old, the public, tracts of evidence, tried in exceptional circumstances, two innocent men, vital to our defence case, voice, warped, We, we believe, witnesses, your nameLeave a comment on Letter from the Craigavon Two, Brendan McConville and John Paul Wooton.